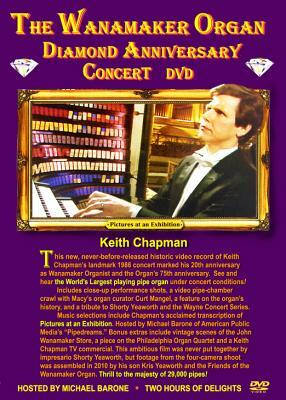 This new, never-before-released historic video record of Keith Chapman's landmark 1986 concert marked his 20th anniversary as Wanamaker Organist and the Organ's 75th anniversary. See and hear the World's Largest playing pipe organ under concert conditions! Includes close-up performance shots, a video pipe-chamber crawl with Macy's organ curator Curt Mangel, a feature on the organ's history, and a tribute to Shorty Yeaworth and the Wayne Concert Series. Hosted by Pipedreams' Michael Barone. Bonus extras include vintage scenes of the John Wanamaker Store, a piece on the Philadelphia Organ Quartet and a Keith Chapman TV commercial. This ambitious film was never put together by impresario Shorty Yeaworth, but footage from the three-camera shoot was assembled in 2010 by his son Kris Yeaworth and the Friends of the Wanamaker Organ. Includes a replica of the original concert program with added reflections on Chapman's astonishing career. Thrill to the majesty of 29,000 pipes in Chapman's capable hands! Order now! The DVD has all region codes enabled so it will play on any NTSC (or multi standard) DVD player and any computer capable of playing DVDs.